Is the POD® Ankle Brace right for me? Whether you have suffered from an ankle sprain or roll in the past, the DonJoy Performance POD is the perfect solution because it supports your ankle without slowing you down. Designed to increase circulation and improve heat regulation, this ankle brace provides compression like taping without the hassle time it takes to put on tape. Easy to put on, the POD doesn't have metal or stays like normal braces, instead it uses the 'Protection On Demand™ technology to prevent ankle rolls, sprains and help prevent instabilities when in motion. Step foot through sleeve and secure straps. Adjust as necessary. The POD® Ankle provides ultimate support without affecting the athlete's natural range of motion. Designed with 'Protection On Demand™' technology to prevent ankle rolls, sprains and other common ankle injuries. View all DonJoy Performance braces or our full selection of ankle braces. Use shoe size as a guide only. For a more accurate fit measure your ankle circumference as shown below. Hello, so I was looking at the sizes and I am right on the edge of the Small or Medium as I wear shoe size of 9-9.5. So I am not sure which one I would be better off either the Small which is the end of the range or the Medium which is the beginning of the range. Any suggestions? Based on your shoe size Mens 9-9.5 we recommend a size Medium. Can you break your lower leg cause you have this ankle brace on? Would it cause less give and then create a lower leg fracture? The Pod is desigend to mimic ankle taping and protect the ankle joint. If an excessive force is placed on the joint it can be dispersed elsewhere that could cause a fracture but this is possible with any ankle brace. Does this brace require a lace up shoe? Will it work with slip on shoes or barefoot? The DonJoy Performance PODÂ® ANKLE BRACE does not require a lace up shoe, however wearing barefoot may affect the lifetime of the bottom of the brace. Donjoy Performance POD ankle brace will give the stability on his ankle and prevent any sprains and rolls while playing. Have ruptured peronal longus and brevis. Resulting in a lot of lateral instability. Am wearing a brace from biuerfiend that controls some but not enough Would your brace control more of the lateral instability I feel when I'm walking? HI, i have a ligament tear in my right ankle that causes pain to the back of my Achilles but once i tape my ankles up and wear a brace the pain reduces. now my question is, is the POD more efficiant than the normal ankle braces? and also i would like one for both lefthand right ankle, do i need to purchase them separately? Yes, you will need to purchased them separately. The DonJoy Performance POD® ANKLE BRACE is a lightweight brace, that provides excellent support that replaces taping. Will this brace help to prevent re-injury of the Achilles Tendon? Hi, How do I measure the ankle to ensure I am purchasing the proper size? Thank you. The POD Ankle Brace is sized according to shoe size. Please click on the Size Chart and Fit Help link on the product page for size guide. I have lateral instability with decreased ROM in flexion/ extension. Will the POD align/ lock the foot into a neutral position? The POD will provide ultimate support without affecting your natural range of motion. The POD will prevent ankle rolls, reduce pain and protect from re-injury. 1. Is donjoy POD better in regards of protection or just being convenient to wear? 2. what is the best attribute of donjoy POD compare to other laceup ankle brace. The POD will provide ultimate support without affecting your natural range of motion. The POD will prevent ankle rolls, reduce pain and protect from re-injury. It is also very easy to put on and take off. Would this brace help with foot drop, for times / shoes where I don't want to wear a full-foot knee height AFO? I have hypermobile joints, and my ankles have rolled in the past. I use an aircast brand brace generally, but looking for something supportive but less bulky. Would you suggest this model to supplement the other? 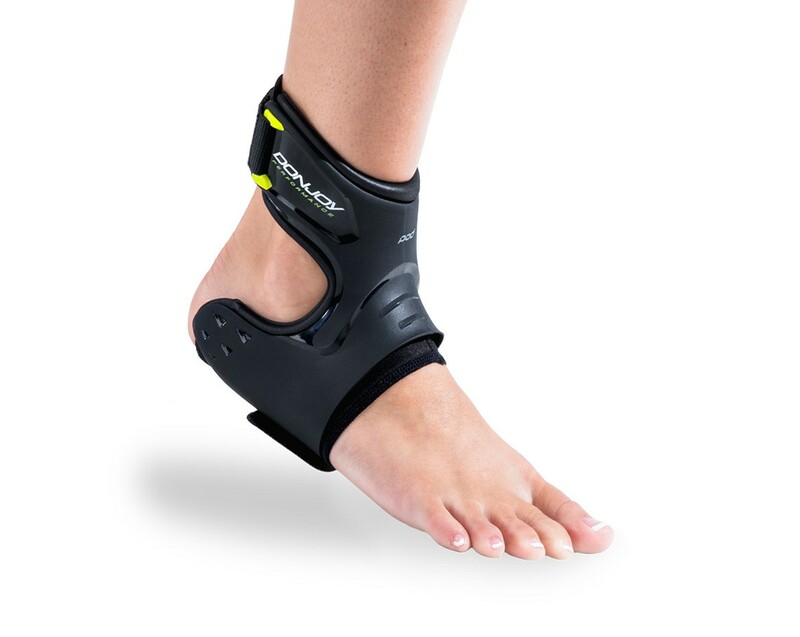 The DONJOY PERFORMANCE POD ANKLE BRACE would be a great supplement for your Aircast support since it will give a rigid support on the sides but still have the mobility to move around without having to hinder your movement. It is low profile and ultra thin with adjustable velcro underfoot closure for a better fit. This brace provides excellent support. My ankles are terrible and roll them stepping on uneven ground or cutting too quickly. The beauty of this brace is that it provides excellent stability while maximizing mobility. I tried many different braces and this one provides the best of both worlds as far as that is concerned. A downside is that the brace straps over my ankle bone and the tension over my bone causes discomfort and brusing. It could be that my feet/ankles are longer than the brace was designed for and so the brace is not positioned on my foot as designed. But I purchased the appropriate brace size for my foot size. Because of this I had to go purchase wrist bands (like what tennis players wear) and wear those over my ankle bones and under the brace strap. This seems to have done the trick as I no longer have pain while wearing the braces. Cons: Discomfort caused by brave strap putting too much tension on my ankle requiring me to improvising by adding cushion between brave and ankle. Best ankle support i've ever worn. Best ankle support I've ever worn. With 11 years of Airborne operations with the U.S Army, I don't have very good ankles and these make me feel like there's nothing wrong with them. Pros: It fits with low and mid top shoes. Flexible inside the shoes. Cons: Don't fit well with high top shoes. Wish the bottom Velcro straps were longer, but could be due to being between sizes. I had a severe drop foot, which was partially corrected by a tendon transfer procedure 6 years ago. This procedure freed me from having to wear an AFO, but left my ankle weak, subject to rollover. I also did not have quite enough strength to uniformly raise my toes. To compound that problem, I had a knee replacement surgery that produced a very poor result. I bought every ankle support and shoe insert that I could find. The only product that was marginally useful were wrap around elastic varieties, but only for about 3 wearings, at which point the elastic stretched out. I received this ankle brace two days ago and am ordering another today. I just finished helping a neighbor work on his yard, which is very steep and uneven, and I was able to work for several hours without my ankle turning over. Even my overall gait has improved, because to my amazement, this brace has flexibility in the arch area. I have no problem with fit or the size of the velcro strap, but that may be because I have a narrow heel and foot. I have no idea about its durability at this point. Pros: Excellent support against rollover, flexibility, easy to put on, and low profile so it fits inside most shoes. Does not rub over my surgical incision scars, but I have worn socks underneath it. It breaks in quickly. Cons: As is typical with an ankle brace, it is uncomfortable if worn when sitting for any period of time, but it is easy to take on and off, so it isn't a huge issue. This gave my 15 year old son the support he needed in basketball. He had a bad ankle sprain last season and has rolled his ankle multiple times even when I would tape it and he would wear an ankle brace we had bought from local drug store. As soon as he put this brace on he felt the support he needed. He has been wearing for almost 3 weeks in practices without any problems. I plan to buy another one for a back-up! Pros: Great support, light weight, easy to put on. No more taping! Def worth the price! Fits great in his basketball shoe too. Cons: I have found no cons at all except that I should have bought this 6 months ago. The brace performs just as described. I really like that aspect. However, the sizing is difficult. Based on shoe size I am a small but based on ankle circumference I am a x-small. I tried both. The small felt a big with a lot of extra velcro. So I tried an x-small. The fit was perfect around the ankle, but under the foot a little more velcro would be helpful. Obviously this is a genetic issue regarding my small ankles (I feel I have avg to narrow feet) and in no way takes away from the brace. Pros: Minimal, Feels like taping, repeated use unlike taping, I felt it did not affect my shoe fitting. Cons: Non-issue with a little more velcro. I bought this brace hoping it would relieve the pain I have had for over two years after an ankle evulsion fracture. I was told the only fix was an ankle fusion or replacement. I could barely walk. I have spent tons of money on braces. This by far is the best. My gait is almost normal with it on. I am so grateful for this brace. Cons: You do have to break it in but that only takes a few days. And being a woman I wish it came in my brown skin town. I love this brace! This brace is amazing, I needed something that would allow me to play soccer and after doing some research I decided to order this brace. I was afraid it was going to limit my movement but it didn't. I don't feel the brace on and it allows me to any movement. I recommend this brace 100%. I have a very weak right ankle due to sports injuries and surgery over the years, and it tends to roll on me when I step on an uneven surface. This brace provides excellent support and allows me to hike and walk on non flat surfaces with much more confidence. Pros: Light weight. Easy to put on. Maintains support over long periods of activity. Cons: Not necessarily a con but can cause discomfort if worn for long periods sitting or riding in a car. Need to take it off if not needed. Should be made mandatory in every Highschool/College/Pro Sporting Organization worldwide. Seamless and amazing integration yet again completed by Don Joy. After putting this through the ringer there was really nothing the brace could not to. My Right ankle has always given me problems when running/training. Since no longer playing collegiate sports, I have not thought to tape my ankle, and all of the other braces I have tried were too bulky, and annoying to put on. This seamlessly protects, and supports the ankle in all of its natural positions. It really is the piece of mind that I was looking for without the overbearing bulk of most braces. I recently (4/2017) rolled my ankle while stepping out of my work truck resulting in fifth metatarsal and distal fibular fractures. After progressing from a boot to a splint, I felt like i still needed some kind of support once out of the splint. I purchased this brace and am very happy with it! It fits in my shoe, is comfortable and prevents me from rolling and re-fracturing myself. I am in and out of a truck all day and this gives me the confidence I need to do my job without worrying about my ankle and foot.